By the time my son entered kindergarten, it was clear to me that scoring 20/20 on the eye chart and being given a clean bill of eye health by a renowned and much recommended pediatric ophthalmologist was not going to be the last word on his vision. There were still too many unanswered questions. Questions like: Why was he always tired? Why did his eyes hurt? Why could he see the tiniest speck of a jet plane 35,000 feet above the earth, but not walk down a flight of stairs without becoming paralyzed with fear? There were other signs as well, the constant rubbing of his eyes, the way he’d zone out in front of the TV, not really watching or seeing what was on the screen. And there was the whole issue of personal space, his lack of orientation to where he was in relation to other objects and people in the room. While I was told that his vision was perfect, the truth was, my son’s visual system wasn’t working properly, or at least not in a productive or efficient way. Skip ahead to May 15th, 2009. My son, now seven-and-a-half-years old, is standing at his vision therapy graduation ceremony, a proud and knowing grin on his face as his therapists congratulate him for all his hard work over the last six months. This place, this happily ever after, is the place I was not sure we’d ever find ourselves. It took nearly three years and a long and winding road to bring us, finally, into the capable hands of Dr. Michele Bessler, a Long Island, N.Y.-based developmental optometrist, and her team. We learned a lot along the way. Educating ourselves, sometimes moving forward on faith alone—despite the fact that many of the well-trained professionals we crossed paths with over the years often dismissed vision therapy as a waste of time and money. 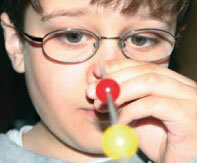 Vision therapy is not a new discipline. Some sources indicate the practice has been around, in one form or another, for centuries. A type of physical therapy for the eyes and brain, vision therapy is a non-surgical intervention for many common visual problems—from lazy eye and double vision to convergence insufficiency and crossed eyes. The treatment protocol is designed to improve and correct binocular, oculomotor, visual processing and perceptual disorders. And when it comes to kids, these problems can have a tremendous impact on academics and self-esteem. Though I knew my son had issues related to his vision, it wasn’t until he was starting second grade that we finally made the commitment to move forward under Dr. Bessler’s care. In spite of all the knowledge I had and research I had done, I have to admit I was still skeptical. I didn’t think he’d do the home exercises. I was wary of committing two afternoons a week to in-office treatment. It was hugely expensive and not covered by our insurance. And I didn’t fully trust Dr. Bessler’s claims that he’d show significant improvement in four to six months. It wasn’t that I didn’t trust her, more that I didn’t trust us. The success of any program lies not so much with the doctor or therapist, but with the participants. Despite my skepticism, we had to try. My son was struggling. He couldn’t read. He couldn’t copy homework assignments off the blackboard. He was tired all the time. He hated school. We had to take a chance. Leveraging her strength in math and her love of optometry and kids, Dr. Bessler moved into the field of developmental optometry, eventually joining and taking over the New Hyde Park, N.Y.-based practice of one of her professors. Seven years ago, the office moved to Westbury, N.Y.
“We have four women doctors here, all of us working part-time, juggling families and our careers,” says Dr. Bessler. 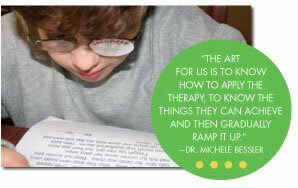 There are also five vision therapists and three office administrators on staff. The practice is referral-based. “We get some referrals from pediatricians, occupational therapists, ophthalmologists and optometrists.” And when the referral comes from another vision professional, Dr. Bessler has a system in place to ensure that patient is referred back to his/her original doctor once therapy has been completed. “Awareness is increasing, but there just aren’t that many of us out there,” she says. Some estimates, in fact, put the total number of developmental optometrists somewhere in the area of 3,000 to 5,000 nationwide. I remember asking Dr. Bessler once what would happen when we stopped doing the exercises. Is it like going to the gym? Do you have to keep up the work to maintain the benefits? I was relieved to hear that in most cases, it’s more like riding a bike. Once you know how to do it properly, you really never forget. What I meant was, had she ever seen him do it, was he completing the exercise in therapy or was it something we needed to work our way up to at home. Guess what? I couldn’t do it. Approximately 80 percent of the practice is focused on treating learning-related vision disorders in kids between the ages of four and 18. But Dr. Bessler and her team also work with adults, including trauma patients and people who have had strokes or neurological injuries. The walls of Dr. Bessler’s waiting room are papered with testimonials and Polaroids of program graduates. It’s a comfortable space, a place where parents strike up conversations with each other as they wait for their kids. “I feel lucky,” she says. Luck? Maybe. But hard work and dedication too. 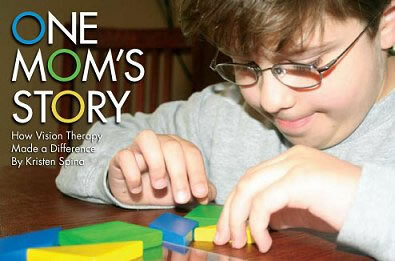 Share the post "One Mom’s Story – How Therapy Made a Difference"